All summer long we’re activating your creative side with free drop-in studio hours every Sunday at SAM. Led by local artists and designed for all ages, the art activities taking place between 11 am and 1 pm during Drop-In Studio: Infinite Reflections will touch on themes and ideas behind Yayoi Kusama: Infinity Mirrors and how the artwork in the exhibition connects to their own work and process. We’ve asked each of our teaching artists to share what about the Kusama exhibition has inspired them and the art activities that they will be leading. This Sunday, July 30, features artist Junko Yamamoto. There are a few things that I can relate to Kusama’s work conceptually and aesthetically. She is interested in the relationships between people and the world by creating infinite imagery of nature and our society. Kusama’s Phalli’s Field has been one my favorite installations of hers since I was young. Organic, white, phallic-shaped soft sculptures with red polka dots in a reflection mirror room create an infinite reality that gives me a chill. All of her paintings are incredible, but I’m always mesmerized by her older paintings from the 1950s to ’70’s. Repetitions of scale- or cell-like small round shapes continues almost outside of the frames. Both installations and paintings can relate to my repetitive shapes and textures. In my work, I explore space, memories, the space between atoms, cells, between people, objects, air, stars, water and sky; the cosmic glue which holds us and the universe together. My repetitive imageries are often inspired by cell divisions or clusters of atoms. Everything that exists in this world is part of us, we are all related to one another, just like how small atoms accumulated to forms entire universe. Unity, as a whole, is my foundation. 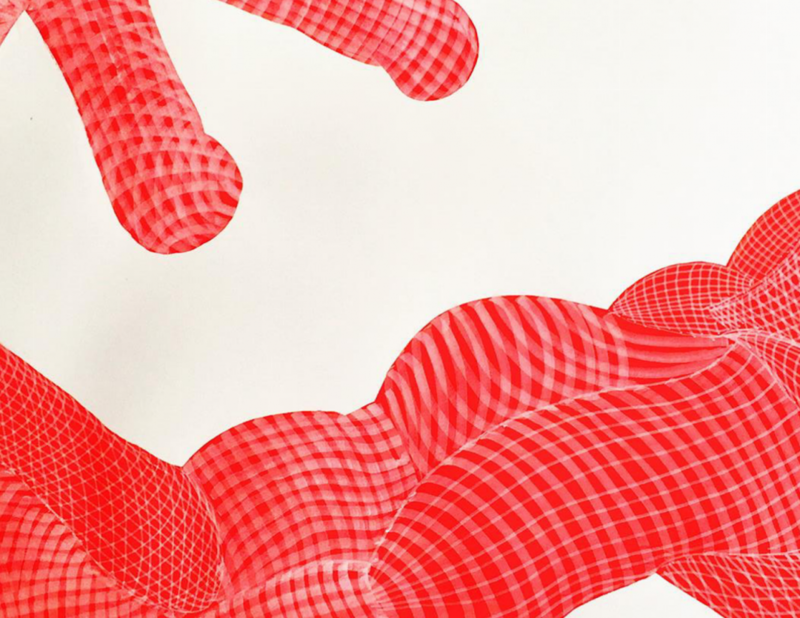 In the spirit of Kusama’s process-based studio practice, we’re going to make collaborative cut paper “Infinity Nets.” As this collective infinity net grows into an immersive installation, elements of form, movement, positive/negative space, light, and shadow will all come into play. I feel a kinship to Kusama’s emphatic nature and I strongly identify with the inherent necessity to keep creating throughout one’s life. Since childhood, I’ve always sought solace through the act of art making. Come explore the resonant power of repetition and accumulation using scissors as your drawing tool! Kusama has artistically given me permission to create my own world and live inside it infinitely. As a painter, I’ve been exploring invisibility using large colorful canvases to create worlds where the invisible is seen. Despite hiding, the women in my paintings are still there. 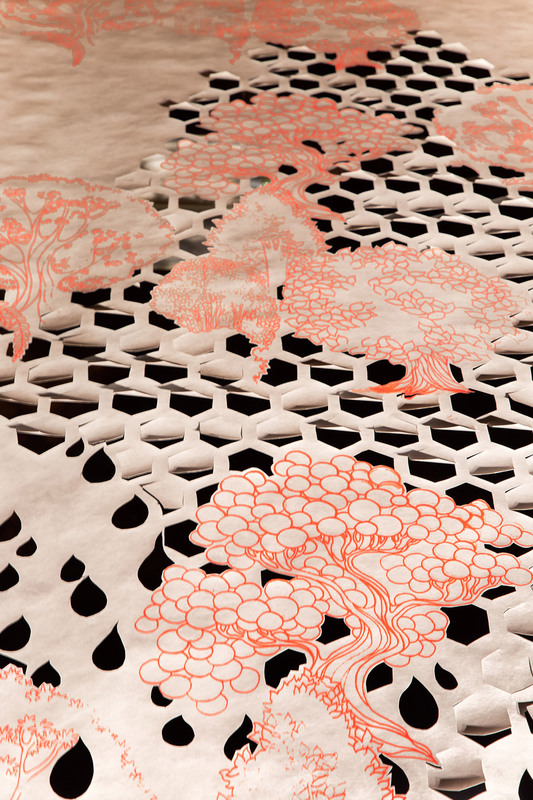 It’s a world where women, daisies, jack-o-lanterns and textile structures can all exist together. Apart from working on this series, I began the publication, Hey Lady, a collection of art honoring one woman per issue. 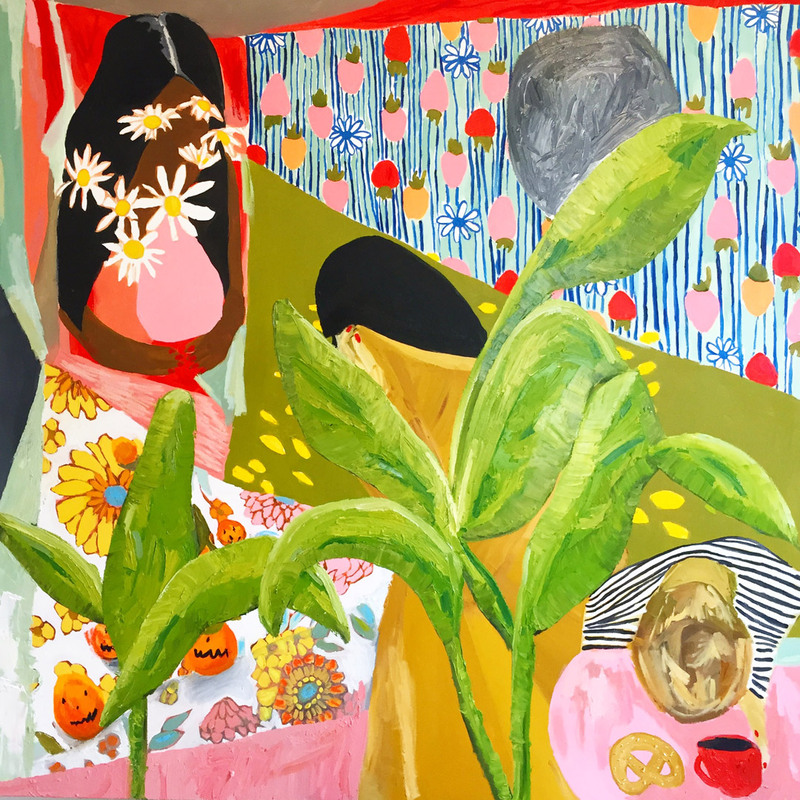 In two years, it has included hundreds of artists internationally, highlighted eight crucial women in various fields, held exhibits around the country, and created a world where women experience a creative outlet that is nurtured, validated, and celebrated. With my workshop at SAM, you’ll be able create your own world exploring your reflection, obsessions and inspiration from the exhibit by making and filling up a handmade zine! My Vermilion Series is a collection of drawings searching out the interface between the psyche and its influences, between inner and outer worlds. The drawings result from my visceral responses to sensation, emotion, and reaction. The use of the color vermilion began as an investigation of childhood memory and has morphed into a practice of working with only this one color for three years. The drawings are made with acrylic forms painted on paper, which I then draw on with white marker. The circular marks transform the flat forms to three dimensions. I intend to suggest the body with its urges, transformations, and ultimate transcendences. In a time when we are increasingly distanced from our corporeal selves by technology and stress, this work attempts to bring to the surface powerful and peculiar sensations, emotions, and reactions, so we may act authentically in this shifting world. The projects we’re doing in the Drop-In Studio begin with the circle or dot, echoing Kusama’s extravagant use of that form. Her focus originated with the hallucinations that caused her to exteriorize her obsessions and fears. Many artists have this phenomenon in common: what would seem to be a departure from sanity or normalcy comes to be the fertile origin of our work. 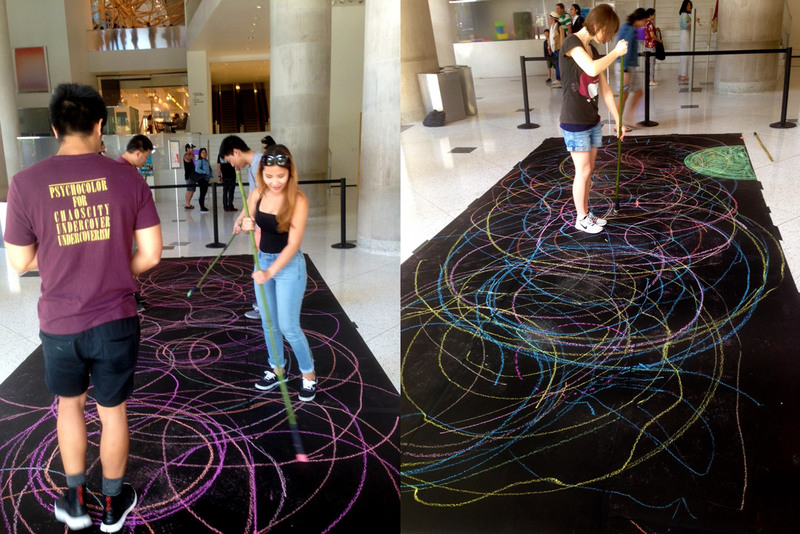 Standing in the center of a black field of tar paper (9’ x 20’), participants draw circles with themselves as the center. Making a mark of chalk on tarpaper is immensely satisfying and is a visceral moment of art made with the body. At the worktables, we’ll use black paper to draw on with opaque markers and circle templates, creating their own take-away artwork. Images: Manifestation, 2017, Junko Yamamoto, 36 x 36 in., oil on canvas. 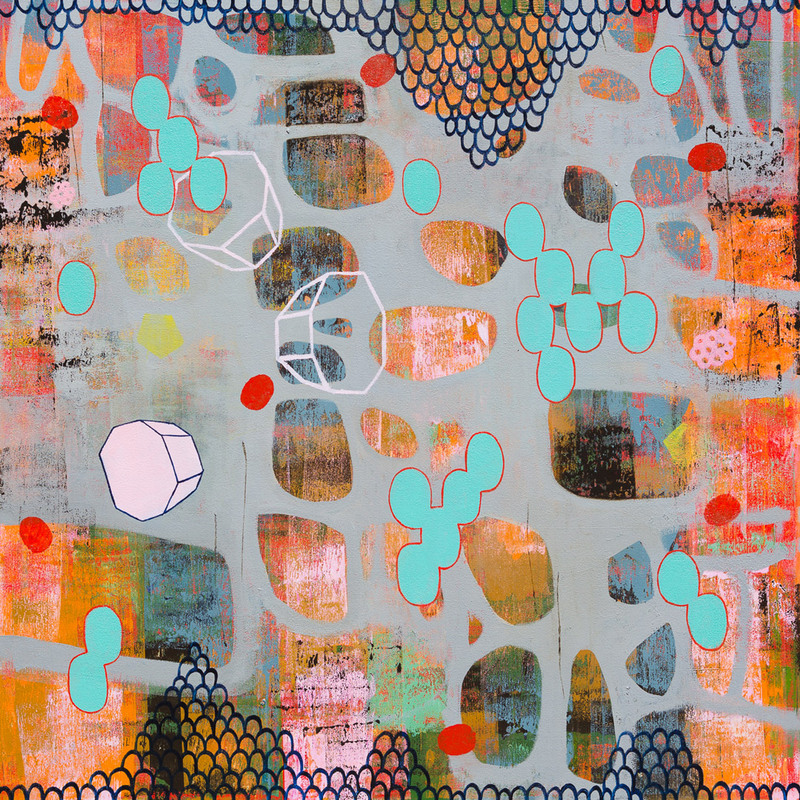 Still Here, 2016, Regina Schilling, oil on canvas, 4 ft x 4 ft., photo: Regina Schilling.Over the River, 2016, Celeste Cooning, installation, screenprint on hand cut Tyvek, paint, mylar, and light. Untitled (vermilion), Ellen Ziegler, 2017, acrylic and white marker on paper, 15 x 11 in.